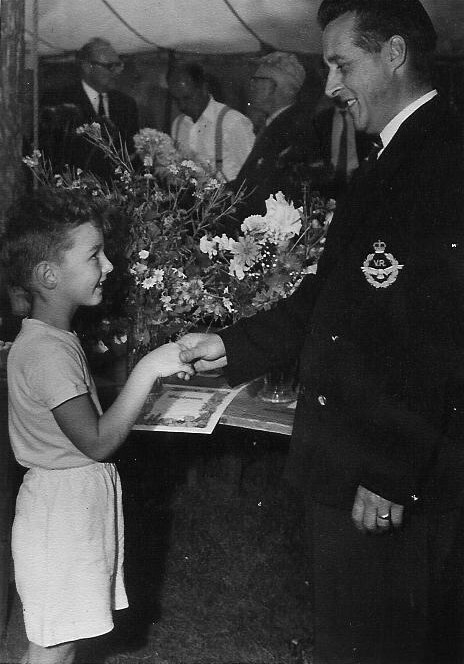 Paul came from a “non doggy” family, his parents greatest interest was gardening, they grew vegetables, dahlias and other flowers which they exhibited at the local flower shows and won many awards and of course Paul exhibited in the children’s classes and this is probably where his “show instinct” came from! 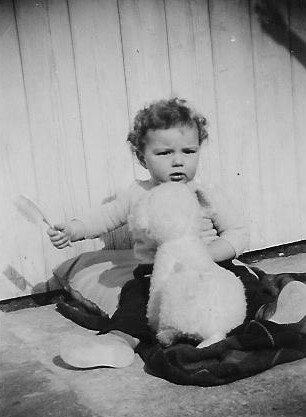 Paul's Interest in grooming started early ! 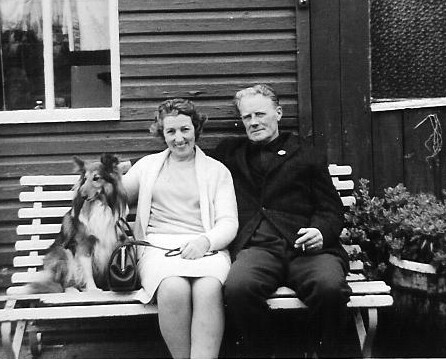 After some years of nagging his parents Paul was allowed to keep the Shetland Sheepdog male which he regularly walked after school and at weekends, this dog was given to Paul by Mr and Mrs Stevens who ran the local boarding kennel and bred Shelties and Cockers and started him off on his breeding and showing career. The dogs name was Tint of Wytchfields and the year was 1964. 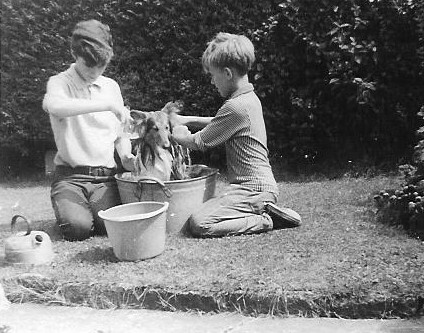 Paul and Mark bathing Tint " old style "
The only thing now in Paul’s head was dogs and on leaving school in 1966 he was determined to work with dogs much to his parent’s dismay. He was offered a job at the famous Grayarlin kennels in the USA but his parents said NO, too young, too far away and this “thing with dogs” was “just a passing faze”! Stubborn as he was (is) Paul went to work for Anne Mathews, kennel Hardacre, famous for her Basset Hounds and who had just started breeding the very rare Tibetan Apsos. After two years of hard work with over 100 dogs, 10 goats, which he learnt to milk and a new baby (Anne’s of course) he moved back home ever grateful to Anne who generously taught him all she knew about dogs, took him to the shows, let him keep his two new Sheltie males from Loughrig and Francehill but most of all for introducing him to the wonderful world of Tibetan Apsos and introducing him to the pioneers of the breed in the UK. One little and rather ugly female Tashi slept on his bed and it was her unique personality that imprinted the breed on Paul for life. Back home Paul acquired a Sheltie female and started to breed and registered his kennel name, from Tint his first dog and living close to the river Avon the choice was natural, Tintavon. 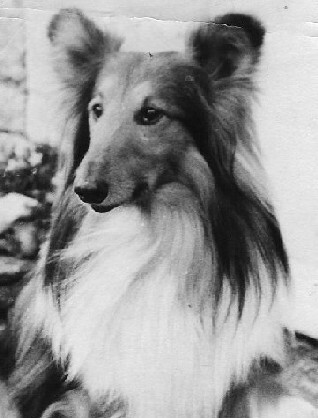 Paul loved his Shelties but could not forget the Apsos and in 1969 he managed to get a female on breeding terms (to buy was nearly impossible at that time) from Irene Plumstead, kennel Showa, her name was Nyima of Showa with Tintavon later added on to the front of her name. The shelties were eased out and in came Apsos which are still dearest to Paul’s heart. 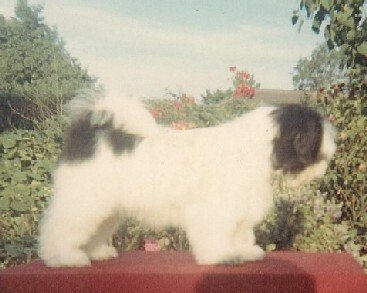 Nyima was never a top show dog, too many missing teeth even for those days but she did have an adorable temperament. Frances Sefton, kennel Cheska loaned out the black puppy male Cheska Gregor when she emigrated to Australia and Thelma Morgan, kennel Ffrith gave Paul the chance to buy Witcherty Thea, a beautiful but rather shy one year old female when he enquired about a litter she had. It is Nyima, Gregor and Thea that laid the ground for nearly forty years of successful breeding. Here we must give our profound thanks to Anne, Irene, Frankie and Thelma who in their trust and faith helped Paul on the way to success! 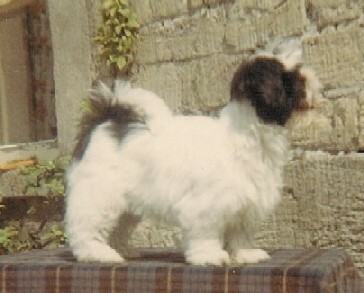 Nyimas first litter with Hardacre Namista Khan produced no stars but Anzahra of Tintavon was kept and mated to Gregor produced the kennels first UK Ch in Tintavon Goldameir owned by Jim Bainbridge, kennel Botolphs. 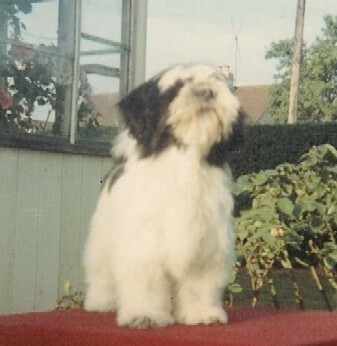 Nyima was then mated to Gregor and produced Tintavon Basieren, winner of 2 reserve cc.s and BIS at the LAC club show in 1972 and Tintavon Burundai who won a cc before being exported to Marina Reuterswärd in Sweden where he became Int and Nordic Ch, group winner and Top Lhasa 1974. 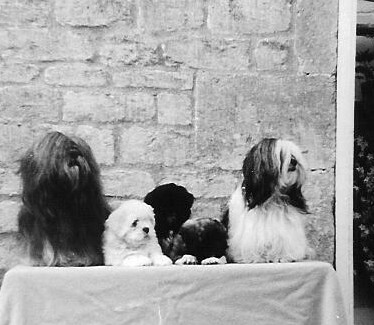 At the shows Paul met many influential breeders and exhibitors of the Tibetan breeds including Graham Newell and Penny Spencer who convinced him he needed a Tibetan terrier and Tibetan terriers needed him (for his grooming skills, he also introduced the middle parting to the breed). 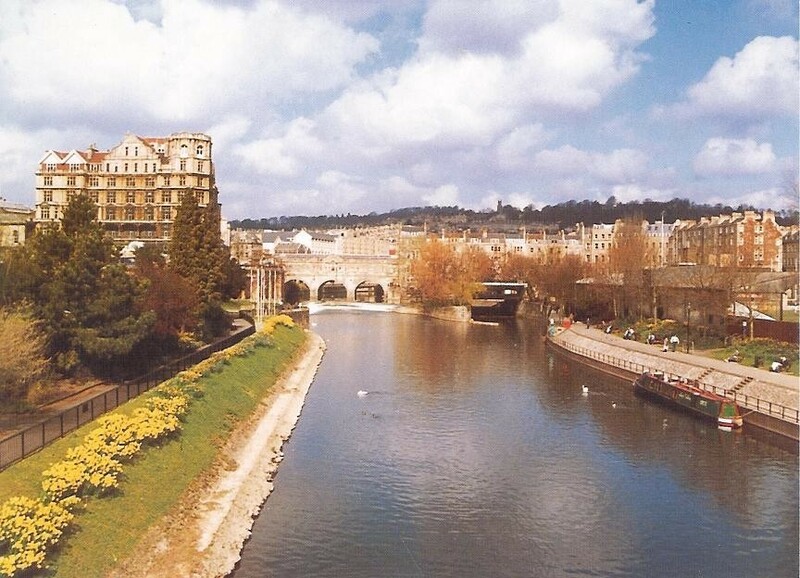 In 1970 the legendry Dokham Cavarodossi was born and “Marco” moved to Melksham in Wiltshire. Marco put the breed “on the map” and made Paul a well known figure in dogs, he was the first T.T to win a group placement, a group and first to win an All Breeds BIS in the World, the year was 1974, he also won 39 cc.s, 2 BIS, BISS, 8 groups and 11 group reserve (group 2nd). Paul had earlier come into contact with the world famous Amcross kennel of Tibetan Spaniels and it was inevitable the breed would come into his life and home. MC and Deirdre generously gave Paul and Terry the male Amcross Kam Dar who already had one cc. he was made into UK Ch and later sold to Lisbeth Sigfridsson, kennel Ulvus of Sweden where he became Int Nordic Ch and most important he sired the breed’s top sire of all time. 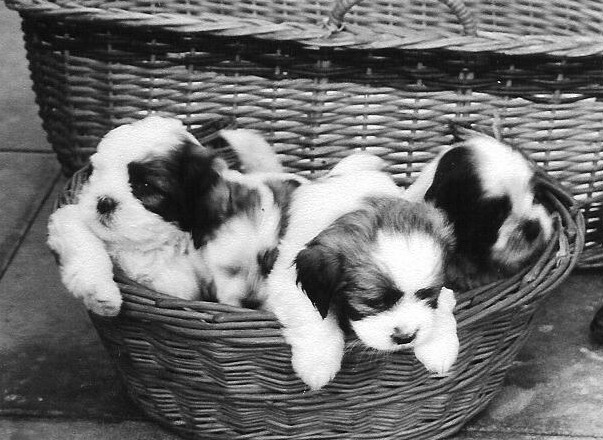 Amcross Ta- Rosa (1cc 2 res.cc.s) came on breeding terms and with Kam-Dar produced UK Ch Amcross Katie (breeders Tintavon) Our third Spaniel was Windameres Nam-Cha of Tintavon who won 1 cc and 3 res.cc.s before being also exported to Sweden. Tintavon is the only post war British kennel to have made up Champions in the three Tibetan breeds (Tibetan Mastiffs have no cc.s in the UK) a feat we are extremely proud of! In 1975 Paul judged at the famous Tibethund (Tibetan breeds dog show) in Sweden and made many new friends and when life became intolerable in England it was only natural that in 1977 Sweden would be his new home.